We have been building All-Welded, All-Aluminum boats since 1988. Ron Daugherty, the owner of WELD-CRAFT Manufacturing, Inc., has been in the boat business for over 40 years. Ron works in the plant to make sure that all WELD-CRAFT boats are being built with quality workmanship and manufacturing excellence. What is great about Ron is the fact that he isn't a 3rd generation boat manufacturer. He didn't go to college just to learn how to run the business and he didn't have it passed down to him. He has been actually building boats for more than 50 years. He knows how to build a boat from lots of experience. Ron is a small town boy from Wilmar, Arkansas. In 1962, at the age of 19 years, he went to work for DuraCraft in Monticello, Arkansas. This is where he got his start in the boating industry. He was a partsman, but desperately wanted to be a welder. His boss agreed to let him practice welding on his lunch hour. After lots of hard work, he became an excellent welder. In fact, Ron is known as one of, if not the top, aluminum welder in the state of Arkansas. From Duracraft he moved on to Ouachita Marine in Arkadelphia, Arkansas, for even more boat building experience. When Ouachita Marine closed their doors, he went to work for Alcoa in Benton, Arkansas where raw material was processed. In 1988, Ron decided that he wanted to build his own boats. So he started his own company, WELD-CRAFT Manufacturing. He began with small Jon boats. When Weld-Craft gained recognition and business grew, he moved on to building Bass models and Specialty boats. He has dedicated himself to building Top Quailty, All-Welded All-Aluminum boats. We would like to express our appreciation to our employees. We would also like to express our gratitude to all of our dealers. They make sure that Weld-Craft is recognized even in the smallest towns. We are proud to have each one of them in the Weld-Craft Family! WELD-CRAFT is strictly a manufacturer. WELD-CRAFT can not & will not sell factory direct to the public. WELD-CRAFT is located in central Arkansas, just South of Little Rock. Most of our dealers are in Louisiana, Texas, and Missouri, but we are expanding our territory frequently. Any interested dealers are welcome to contact us. If you are an existing Marine Dealership (i.e. sales of boats, motors, recreational watersport or off-road vehicles, tackle, hunting supplies) and would like information on becoming a dealer of Weld-Craft Aluminum Boats, please send your application to wcb.om.rw@gmail.com or fax (501)794-3471 or call (501) 794-4210. 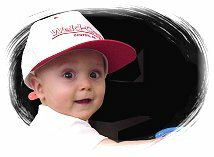 Even the youngest fisherman love Weld-Craft Boats! !